3 pink fish (& a fry): Bathing Buddies! 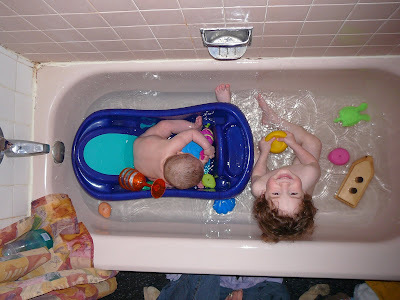 Now that Rosie can sit up and play, bath time has become much more fun! Despite the many duckies and the infamous armless crocodile that William has offered her, Rosie's bath toy of choice remains the orange wine glass - well done Sweetie! Dear Rosie: Nice choice of toys with the orange wine glass. Your Auntie Meg gives you a big round of applause on that one!